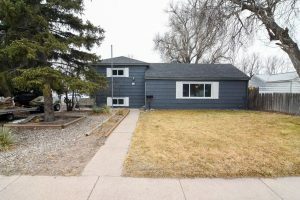 Check out 2419 E 10th Street in Cheyenne WY! Located in a quiet neighborhood in the Kelley’s Addition 2419 E 10th Street is perfect for a first time home buyer or family. Priced at just $195,000 you’ll enjoy three bedrooms, two bathrooms and a large corner lot with plenty of trees. The layout of the home is a tri-level with 1627 square feet. This home boosts a unique floor plan for the area. Your kids and dogs will enjoy a large yard for running and playing! No garage, but a nice carport. You’ll be close to daily necessities, since the home is just off Lincolnway. Fast food restaurants, Walgreens, Albertsons and Murdochs, to name a few close options, are within minutes of this home. You’ll find full listing details here. Similar listings include 4348 Pathfinder Ave and 1115 Windmill Rd. If you are ready to take a look, contact Larry Gardner at 307-631-6895 or visit him online! He is always ready to help your dream of homeownership become a reality!